Private investigator Cormoran Strike returns in a new mystery from Robert Galbraith, author of the #1 international bestseller The Cuckoo's Calling.­When novelist Owen Quine goes missing, his wife calls in private detective Cormoran Strike. At first, Mrs. Quine just thinks her husband has gone off by himself for a few days--­as he has done before--­and she wants Strike to find him and bring him home.­But as Strike investigates, it becomes clear that there is more to Quine's disappearance than his wife realizes. The novelist has just completed a manuscript featuring poisonous pen-­portraits of almost everyone he knows. If the novel were to be published, it would ruin lives--­meaning that there are a lot of people who might want him silenced.­When Quine is found brutally murdered under bizarre circumstances, it becomes a race against time to understand the motivation of a ruthless killer, a killer unlike any Strike has encountered before...­A compulsively readable crime novel with twists . . . 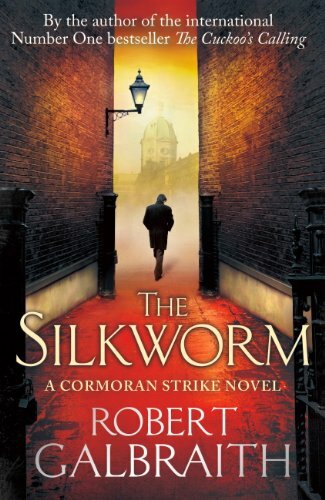 Private investigator Cormoran Strike returns in a new mystery from Robert Galbraith, author of the #1 international bestseller The Cuckoo's Calling. When novelist Owen Quine goes missing, his wife calls in private detective Cormoran Strike. At first, Mrs. Quine just thinks her husband has gone off by himself for a few days--­as he has done before--­and she wants Strike to find him and bring him home. But as Strike investigates, it becomes clear that there is more to Quine's disappearance than his wife realizes. The novelist has just completed a manuscript featuring poisonous pen-­portraits of almost everyone he knows. If the novel were to be published, it would ruin lives--­meaning that there are a lot of people who might want him silenced. When Quine is found brutally murdered under bizarre circumstances, it becomes a race against time to understand the motivation of a ruthless killer, a killer unlike any Strike has encountered before... A compulsively readable crime novel with . . .
A brilliant debut mystery in a classic vein: Detective Cormoran Strike investigates a supermodel's suicide. After losing his leg to a land mine in Afghanistan, Cormoran Strike is barely scraping by as a private investigator. Strike is down to one client, and creditors are calling. He has also just broken up with his longtime girlfriend and is living in his office. Then John Bristow walks through his door with an amazing story: His sister, thelegendary supermodel Lula Landry, known to her friends as the Cuckoo, famously fell to her death a few months earlier. The police ruled it a suicide, but John refuses to believe that. The case plunges Strike into the world of multimillionaire beauties, rock-­star boyfriends, and desperate designers, and it introduces him to every variety of pleasure, enticement, seduction, and delusion known to man. You may think you know detectives, but you've never met one quite like Strike. You may think you know about the wealthy and famous, but you've . . . Her boss, private detective Cormoran Strike, is less surprised but no less alarmed. There are four people from his past who he thinks could be responsible&#8212;­and Strike knows that any one of them is capable of sustained and unspeakable brutality. "I seen a kid killed...­He strangled it, up by the horse.­"
Trying to get to the bottom of Billy's story, Strike and Robin Ellacott-­once his assistant, now a partner in the agency-­set off on a twisting trail that leads them through the backstreets of London, into a secretive inner sanctum within Parliament, and to a beautiful but sinister manor house deep in the countryside. But as Strike investigates, it becomes clear that there is more to Quine's disappearance than his wife realises. The novelist has just completed a manuscript featuring poisonous pen-­portraits of almost everyone he knows. If the novel were published it would ruin lives - so there are a lot of people who might want to silence him.